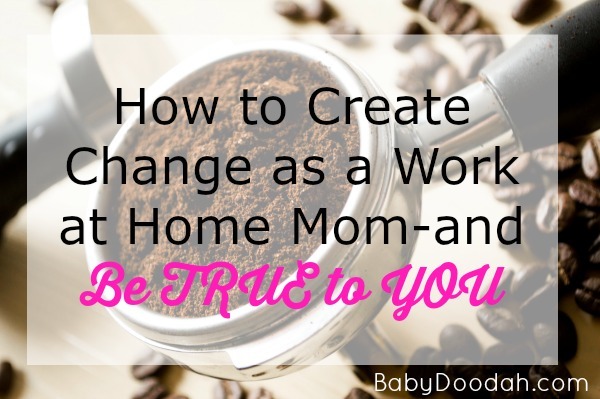 Enough is Enough - On Making Change and Being True to You - Baby Doodah! I know I’ve talked about re-branding, changing the direction of my blog and having a whole new template, a couple times on my blog. I think I first brought it up about 3 months ago, in this post, On Starting a Business. However, here I sit with the same blog, across all areas. I’m not growing or changing, I’m just staying put. It’s a damn struggle, too! I love being a mom. It is the best job I’ve ever had, but I don’t have a passion for writing about it like I did when Emmett was first born. This is the reason that you’ve seen my post frequency getting less and less, I just don’t have the drive to write about it. Yes, I know, I’ve read the posts too, where you just need to force yourself to write and then the routine of it will create the drive. However, this is different. I am not avoiding writing altogether, I’m mentally avoiding writing about the topics that fit the niche of my blog. I just don’t have any interest in writing about them. It’s sad, because writing about being a mother was the very reason I create Baby Doodah! I wanted a place to document Emmett’s growth and change through the years, and I wanted a place to share everything as a first time mom, with other first time moms. However, that season of my life has passed. That’s not to say we won’t have more kids, we will… but currently, I just don’t desire to write about the ways of motherhood. Before you start worrying about whether Baby Doodah is going dark, let me reassure you, my blog isn’t going anywhere. However, the direction of it will be. My true interests and desires lay in helping female (typically moms) entrepreneurs find peace with the direction they want to take. I want to help you find the time to start your side hustle, start and keep a blog, begin a business, all while still being an engaged parent. This doesn’t mean you won’t ever find a post about my family, or that I won’t slip in an update about Emmett here or there, it simply means that my main focus is changing. My heart is speaking to me, and it is FINALLY coming in LOUD and CLEAR. I have topic upon topic that is just keeps pouring out of me, dying to be written. I need to follow this path and let the words in my heart sore! I’ve been putting the change of my blog, off, telling myself that as soon as I re-brand and get my new blog design up, I’ll start following the business path. Then, I’ll write about business-centric things. But what is the waiting leading to? No posts (other than my link-up, Turn It Up Tuesday). That’s no good, especially when my fingers are just itching to glide across the keyboard. So, the procrastination stops NOW! Eventually I’ll get my re-branding done, and eventually I’ll move over to my new design – but for now, I’ll stay right here and let my heart have what it wants! Are you or have you been stuck on any area of your business or blog? Share in the comments below and I can help you smooth through the struggles.